In each new place, with an extended stay, we learn things about local culture. A ride to Cinco de May (the Mission District of Panama City) should cost no more than $4 from Las Brisas de Amador (where our house is anchored). Police and military provide helpful information and protect our safety (nothing happened, they just told us to get home before dark). 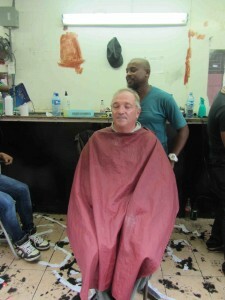 Haircuts are easy and fun – and we can pretend we are locals. 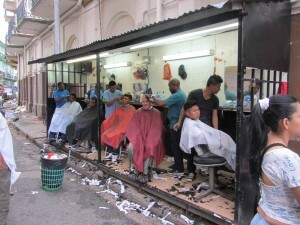 The barbers line up at a stall with their barber chairs, 4-5 per, with very loud house music. Complete cuts for the men in about 15 minutes are $3. 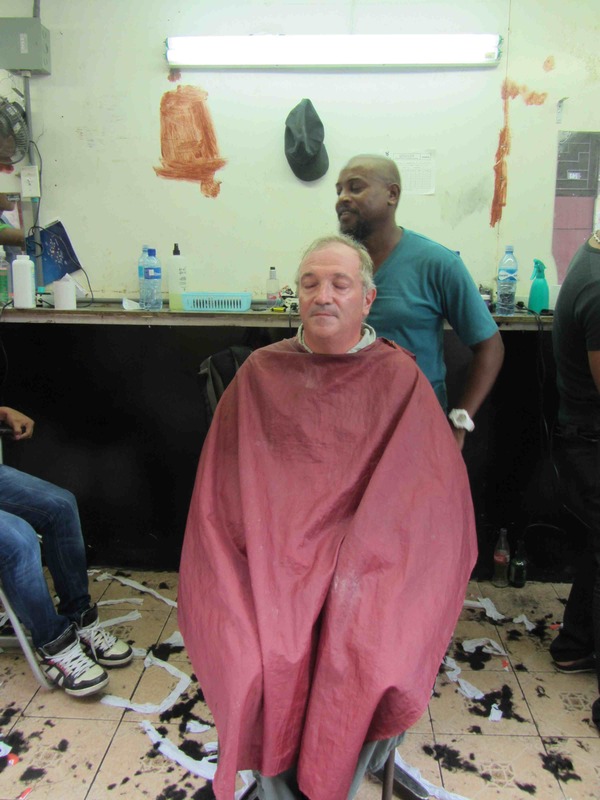 Customers line up in front of their favorite barber and, with the inclination, it is possible to get cutouts, mullets, mohawks, tram lines, patterns or a traditional buzz cut. This is the whole haircut stall. No extra charge for a wash (because it doesn’t exist) and with people passing through the center of the square in Cinco de Mayo, there is no shortage of onlookers. Besides, if we were really feeling stressed, next door to the barber was a lady with a folding chair doing manicures and pedicures and another telling fortunes (Spanish for Tarot is Tarot)! 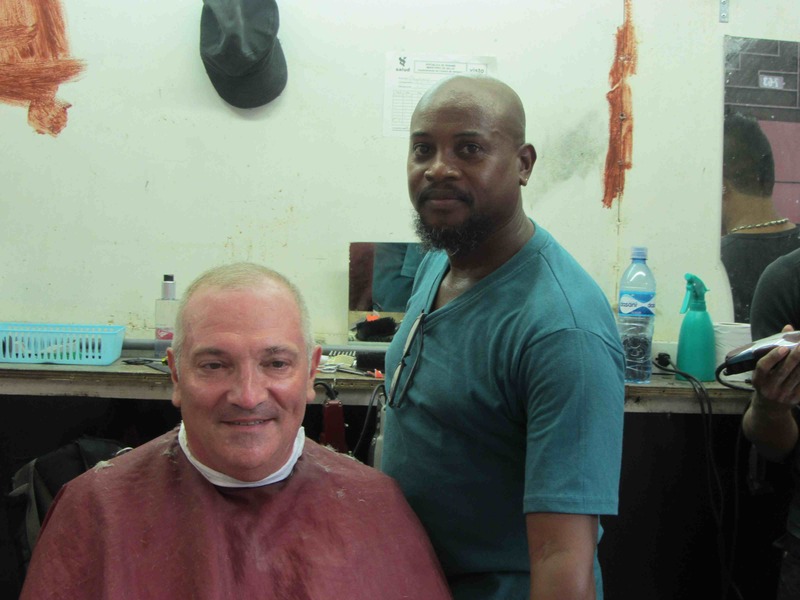 Tony decided his hair needed a trim as the boat barber has been on holiday. Mr. Barber and a satisfied customer! His great grandparents moved to Panama from Jamaica to assist in the Canal build. The family lived in Bocas del Toro and while he worked in Panama City, he preferred Bocas del Toro because the people were friendlier. English is his second language…he learned from his Mom and Grandma (complete with Jamaican accent). Stay tuned for more On Delay adventures! This entry was posted in Panama by Gayle. Bookmark the permalink. Loved the Panama Canal post. Ken thought it was great. Lynda and Eric are so excited to come visit. I love your posts. To all on On Delay. Glad to hear you made it to the other side. I hope you have a lot of chain out, big tide swings. You are so right about big tides. It really takes some getting used to. We have bought more chain and more polypropylene rode.